Cell phones are part of our lives these days. So much so that it's hard for younger drivers to imagine what life was like without them. Even though they are essential, there are times when people should be without them. For instance, when they are driving. Whether it's New York City or White Plains, distracting yourself behind the wheel is an awful idea. The attorneys at Worby Groner Edelman, LLP take all auto accidents seriously, especially when they are caused by avoidable actions such as texting while driving. Our auto accident attorneys will hold negligent parties accountable for their irresponsibility. As we're about to see, cell phone use while driving is extremely irresponsible. It's been estimated that roughly 1.3 million auto collisions in 2011 were related to the use of cell phones behind the wheel. That's 23% of all auto collisions that year. More recent numbers suggest that cell phone use while driving causes up to 1.6 million accidents and 330,000 injuries each year. These numbers seem to fly in the face of various surveys in which young drivers think that texting and talking while driving is easy (55% believed this) and that they can do both safely (77% believed this). The level of distraction and inattentiveness of texting and talking while driving is roughly the equivalent of driving after four beers. That's right, it's like intoxication. In fact, cell phone use even makes motorists six times more likely to become involved in a collision than driving over the legal limit. While simply dialing or talking on the cell phone makes accidents two to three times more likely, texting while driving makes an accident 23 times more likely. 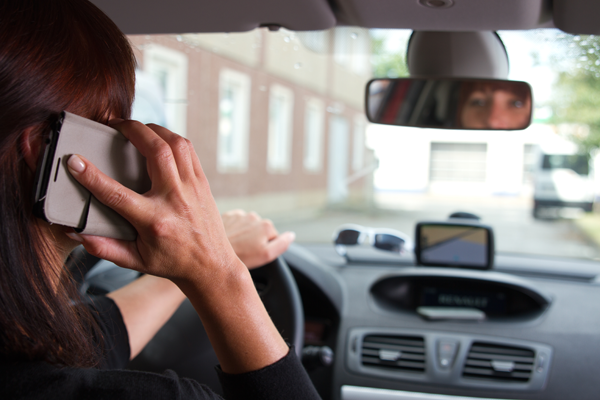 A study suggested that driving while using your cell phone is the equivalent of driving blind five seconds at a time. How much can happen in five seconds? If you are driving 55 miles per hour, you will travel about 100 yards in that time. This should help put things in perspective. Surcharges of up to $93 can apply to the above fines. When it comes to cell phones or any mobile device behind the wheel, the smart thing to do is simply put it away. The call can wait, the text can wait, and the email can wait. Pay attention to the road and to others with whom you are sharing the road Only use your cell phone when your vehicle is safely parked. Doing the common sense actions above can save lives and save you from facing a legal claim from an injury victim or the loved ones of a deceased auto accident victim. For more information about the many dangers that are posed by cell phone use while on the road, be sure to contact our personal injury attorneys today. Our entire team looks forward to meeting you in person and helping you receive just compensation in your time of legal need.